A pink Victorian house overlooking a cemetery: I’m in love. 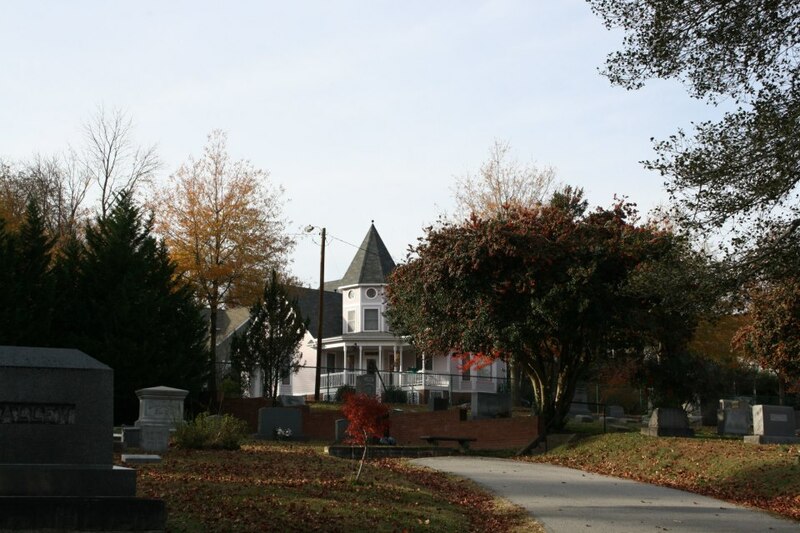 Raleigh, North Carolina’s Oakwood Cemetery is well worth a visit if you get the opportunity. This well-maintained cemetery covers just over 100 acres and boasts stunning examples of graveyard architecture spanning 140 years. I’ve been to Oakwood twice and still haven’t explored all the grounds, which means I’ll be going back soon (hopefully). Ouida Estelle Emery Hood’s grave is marked by one of the most elaborate memorials I’ve seen throughout all of my grave travels. I think you would agree that based on her memorial someone must have loved her dearly to erect something so large and expensive. 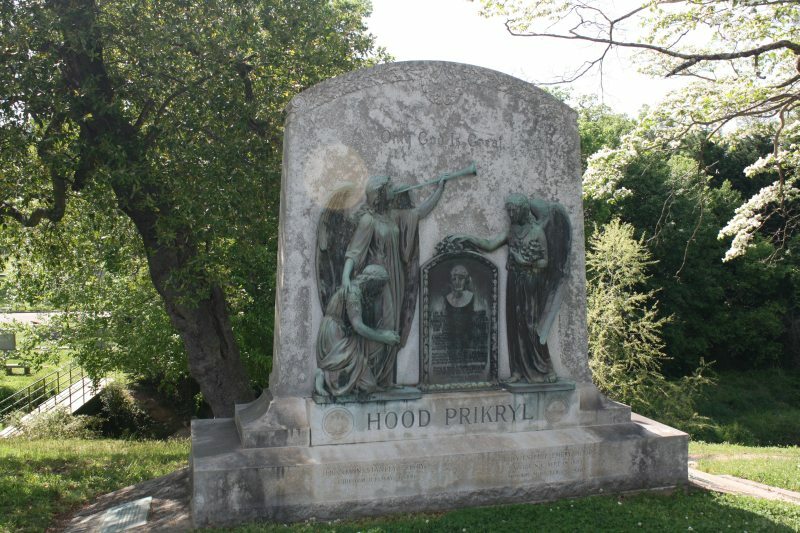 I saw that there were two names carved into the base of the monument, one was Ouida’s and the other name was Franklin Stanley Prikryl. Only a birth date was listed for Franklin, so at the time I thought his absence in the plot was another case of a spouse having remarried and moved on in both life and death. 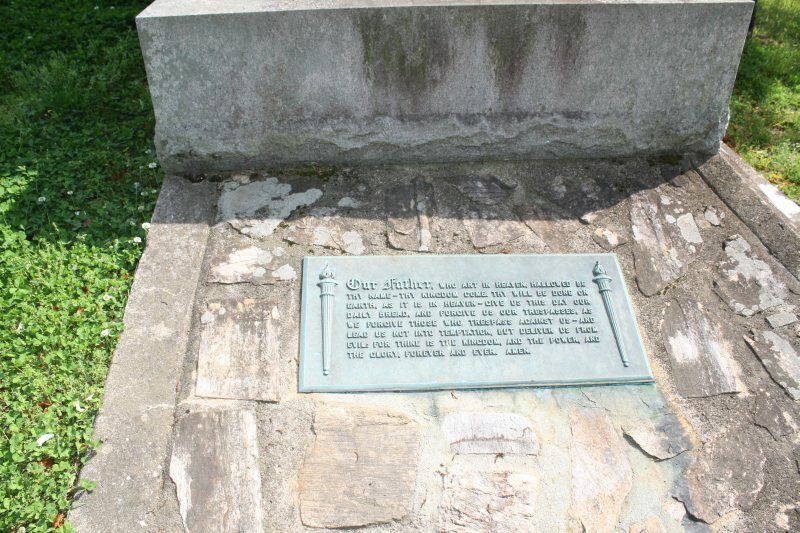 The real story behind the monument and Franklin and Ouida’s relationship is a fascinating one woven across time, friendships, financial prosperity and ruin, and the miles between North Carolina and Michigan. Franklin and Ouida were never married; in fact she was married to another man who mysteriously left after signing over their home to her. 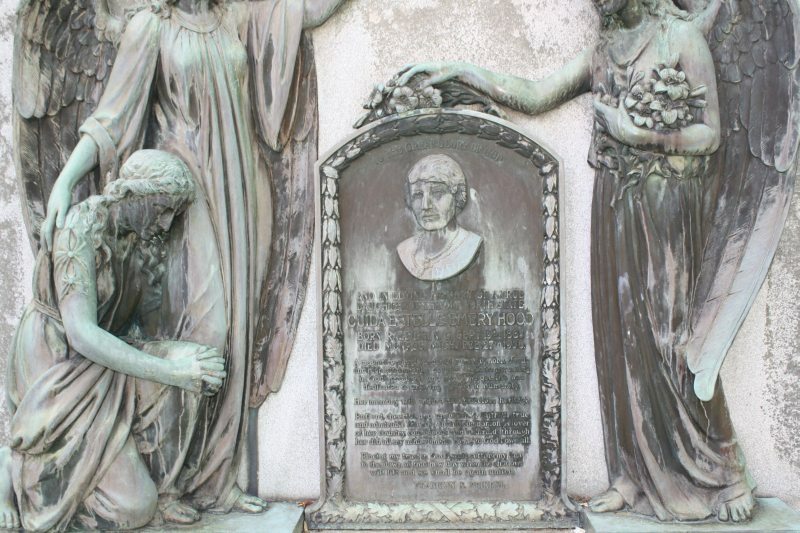 After Ouida’s death Franklin not only had her body sent back to Raleigh and commissioned her monument, he had soil from her flower garden in Michigan shipped to the cemetery and spread over the grave so that flowers and grass would flourish there. 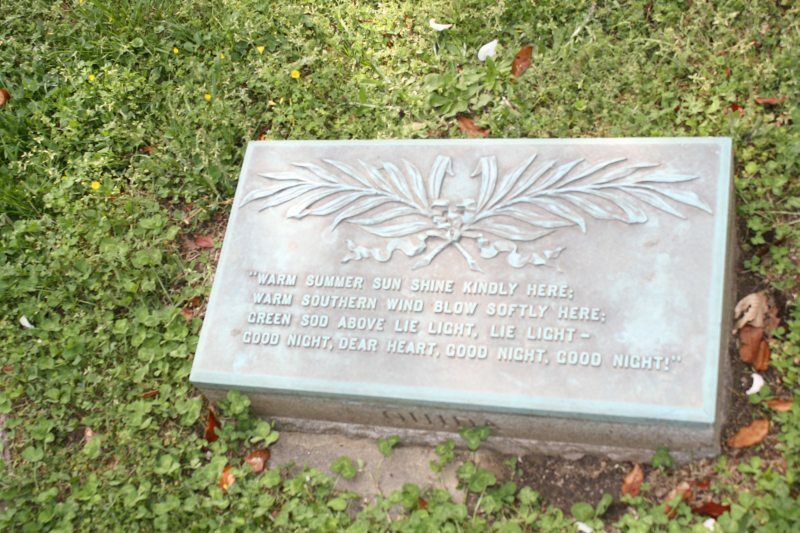 He had the marker inscribed with his name so that he could be buried with Ouida, but when he died in 1962 he chose to be interred near his relatives in a California cemetery. 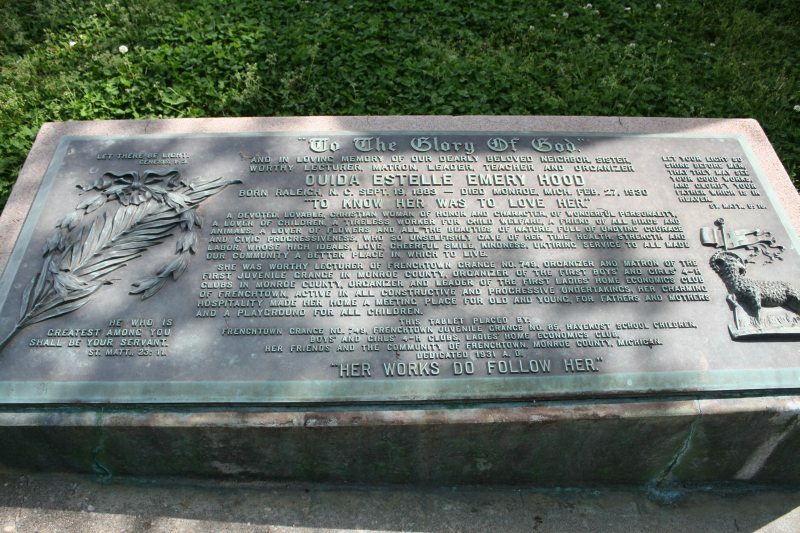 You can read a more detailed account of how the lives of Ouida, her husband, and Franklin were connected on Oakwood’s site. This article in The Sunday Morning Star‘s September 13, 1931 issue contains a few additional tidbits as well as a photo of Ouida taken during the last years of her life. According to the article, Ouida “lived under a shadow-the kind of shadow that often warps a child’s whole life.” I’m curious as to what that “shadow” was. Why Franklin decided not to be buried beside his beloved Ouida remains a mystery, one which may never be solved. The planning, consideration, and money he invested in creating her memorial will live on as a reminder of his devotion and affection even though Ouida’s body rests beside a vacant grave. What an amazing monument and an amazing story to go with it. Thank you for linking up with Cemetery Sunday. Wow — this is so cool! And how fascinating, too.